This exercise is an analysis of the colors that occur in a few of my pastel works. I took them with an eyedropper, in Photoshop, and made these digital swatches using a brush tool. The goal is to have about 26-36 colors when I'm done. I need more explanation of what's going one here. If I had the Photoshop software, I'm sure I would get it--"eyedropper" was the clue. (I do have Publisher and wondered what the eyedropper was all about). You are mixing colors in your computer by taking them from photographs of your work and then combining them to discover new mixes. The process will also reveal how to gear your palette for photographic accuracy? Please expound on this post dear friend, LR. 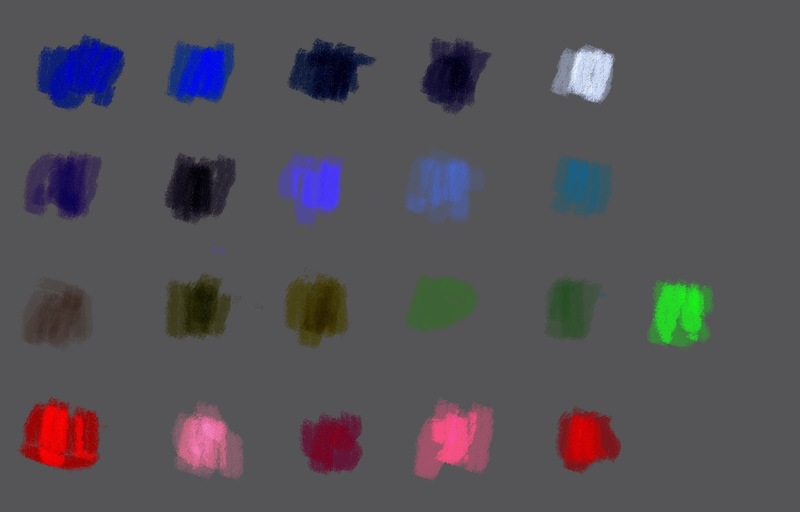 I'm taking these colors from photos of my favorite works. I started the project by getting photos of actual pastel sticks, and trying to create a montage in Photoshop. That was pretty stupid. Then, I realized that I could take the actual colors I use with the little eyedropper tool in PS. It pulls the color and then you can use the fill bucket or a brush tool to make marks. What will I use this swatch image for? Well, for starters, a couple of posts. And, it may inform my work in the near future. I don't think it would help with photographic accuracy, though. I would like a cheat for that, but this is an RGB color already, so it wouldn't do.